Strategy – Where to Play? On Friday at lunch, Sandy, a VP of Business Development and Strategic Cost Reduction Leader for a Scaling Up company in Cedar Rapids revealed one of her customers told her this. Sandy’s business development team brought $20M in new sales to the company in the past 4 weeks. She is responsible for this business growing 35% this year alone. WHERE TO PLAY brings this kind of success! Strategy is TOP LINE REVENUE GROWTH. Sandy, the person I met, is one of the best at business development. She is an A Player’s A Player! Where to Play is understanding the possible playing fields and choosing between them. It’s selecting regions, customers, products, channels, and stages of production that fit well together. They mutually reinforce and marry well with real consumer needs. Find a strong set of where-to-play choices. To do so requires deep understanding of users, the competitive landscape, and your own capabilities. It requires imagination and effort. In Playing to Win Lafley shares the story of a small farmer to illustrate the questions and determinations required for Where-to-Play. The pun here is intentional. A small farmer must answer a number of questions to get a clear sense of his playing field. Will he sell only locally or to his friends and neighbors? Will he attempt to join a co-op that has a larger geographic footprint? Which fruits and vegetables will he grow? Will he sell organic products or standard ones? Will he sell bushels of fruit unprocessed or process apples into juice before selling them? Will he sell direct to consumers, or through a warehouse middleman? If he does process the fruit into juice, will he do that himself or outsource that phase of production? The farmer should thoughtfully consider where to play in a manner that enables him to choose geographies, segments, products, channels, and production options that work well together. The choice of where to play defines the playing field for your company. It is a choice about where to compete and where not to compete. 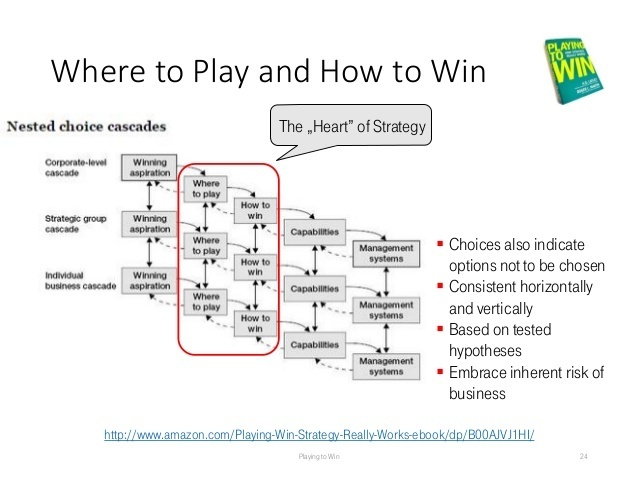 The playing field you choose is also where you need to find ways to win. Geography. In what countries or regions will you seek to compete? Product type. What kinds of products and services will you offer? Consumer segment. What groups of consumers will you target? In which price tier? Meeting which consumer needs? Distribution channel. How will you reach your customers? What channels will you use? Vertical stage of production. In what stages of production will you engage? Where along the value chain? How broadly or narrowly? Small businesses may have narrower Where-to-Play choices than larger companies, due to capacity and scale. The largest companies must make explicit choices to compete in some places, with some products, for some customers (and not in others). A choice to serve everyone, everywhere—or to simply serve all comers—is a losing choice. Choosing where to play is also about choosing Where not to Play. This is more straightforward when you are considering where to expand (or not). It’s considerably harder when considering if you should stay in the places and segments you currently serve. The status quo—continuing on in the locations and segments you’ve always been—is all too often an implicit, unexamined choice. Simply because you have made a given where-to-play choice in the past is not a reason to stay there. There is a lot to consider when crafting a winning Where-to-Play choice, from consumers to channels and customers; to competition; to local, regional, and global differences. Your strategy can easily fall prey to oversimplification, resignation, even desperation. It just means they’ve made NO choice. Lafley shares in the book, even P&G can’t serve all markets equally well. With Bounty, it chose to target three segments of consumers in the top end of the North American paper towel market; it chose not to serve the rest of the world or consumers for whom price was the primary decision criteria. Companies often attempt to move out of an unattractive game and into an attractive one through acquisition. Unfortunately, it rarely works. 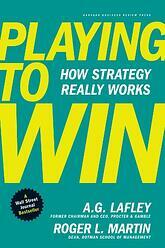 Lafley shares the pitfalls for doing so in Playing to Win. Please read Playing to Win if you are considering a move like this. In 1996 the radio station I was part owner of sold to a station attempting to gain more attractive audiences. They purchased two other stations simultaneously. In less than a year the revenue of our station, I learned, dropped to 10% of what it had been. Perhaps the other two stations made up for the losses? Acquisitions are challenging. Most often, an acquisition adds complexity to an already scattered and fragmented strategy, making it even harder to win overall. You may feel you have no choice Where to Play. Lafley suggests this is just a great excuse for mediocre performance. It is not easy to change playing fields, but it is doable. Sometimes the change is subtle, like a shift in consumer focus within a current industry. Other times the change can be dramatic, like at Thomson Corporation. Twenty years ago, my first wife worked for Thomson Corporation when their Where-to-Play choice was North American newspapers, North Sea oil, and European travel; today (as Thomson Reuters), it competes only in must-have, software-enhanced, subscription-based information delivered over the web. The old and new Where-to-Play choices for Thomson have zero overlap. Thomson took twenty years to achieve this change. It demonstrates changing an existing where-to-play choice is doable. Thomson is a good example of a company being ahead of digital disruption. Did they envision the decline of newspaper, realizing their existing choice didn’t need to be a death sentence? Giving in to any one of these temptations leads to weak strategic choices and, often, to failure. The 3 Strategic Disciplines: Priority, Metrics and Meeting Rhythms help your business dramatically improve your forecasting, and alignment. It empowers your team to achieve accelerated growth. Strategic Discipline paves the road to success on your 3-5 year plan. 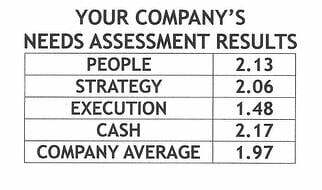 Strategy Decisions should result in top line revenue growth. 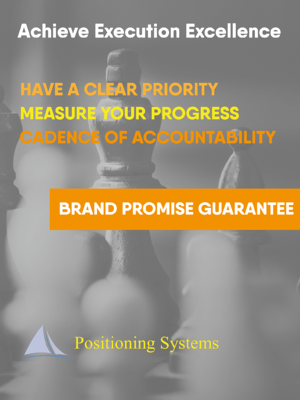 Positioning Systems helps you navigate and determine your best strategy for your future growth. With experts like Kaihan Krippendorff (Outthinker Process) we bring superior experience to elevate your Strategy decision-making. Next Blog – Strategy Step 3: How Will We Win? Winning means providing a better consumer and customer value equation than your competitors do, and providing it on a sustainable basis. There are just two generic ways of doing so: cost leadership and differentiation. Learn how to win next blog.